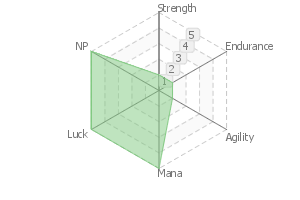 Increase NP Gauge for one ally. 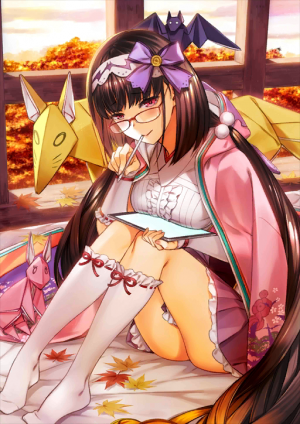 When equipped to Osakabehime only, increase all allies' NP gain by 15%. 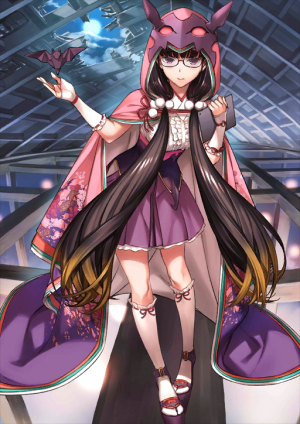 Osakabehime (mentioned in “Saikaku Shokoku Banashi” as the apparition who haunted the Saga Prefecture’s Palace, and named in “Konjaku Gazu Zoku Hyakki” as “The One with the Great Wall”) is a yokai, once enshrined as the ruler deity of Himeji. 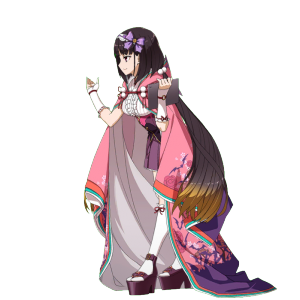 Nowadays, she settles in the keep of Himeji Castle, and is renowned as the famous castle-ghost. Being a shut-in is as sweet as nectar itself, Internet Mail-orders are the Apple of Eden, Binge-shopping e-books and painted figurines brought refreshing feelings resembling a nice pond. Real-life friends are nonexistent. At first glance she’s just a neat and tidy, black haired young maiden. However, if you look past the surface, her self-abasing, gloomy nature can be annoying. She assumes the air of a princess and tries to act like one, but since her inter-personal communications skill are severely limited, she can’t talk much beyond the cliché templates lines. When her wickedness comes into question, the only thing that can be felt is a mere misdemeanor of a minor scoundrel after all. At worst, she uses credit cards to shop as she please. The Origami foldings can be manipulated freely. Whether to attack, defense or even combined as a dovetail for decoy. It can be morphed into various forms and used in many ways. In front of human beings, she took forms ranging from 17-18 years old maidens in 12-layered ceremonial kimono to demon-gods 10 shaku in height. 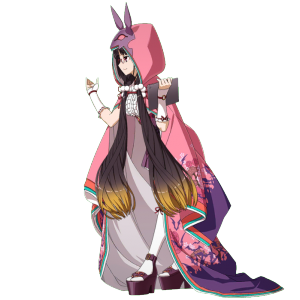 During peaceful times she’s the top ranker in Japanese Transfiguration. A collective term for the creatures who moved from the likes of Shrines into the castle. 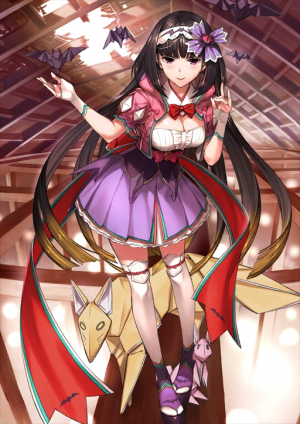 It was said that Osakabehime was the true ruler of Himeji Castle. Even the mere glimpse of her figure will cost one’s life. On the contrary, the further she ventures outside the castle, the weaker her powers will be. Truthfully speaking, originally when she lived 300 years ago she was a “fox”. 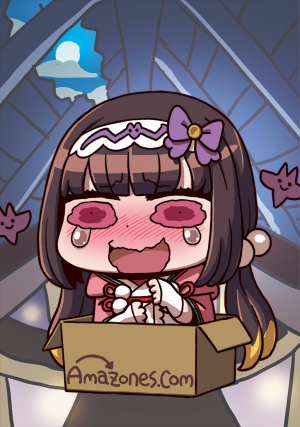 But in this meta-only SNS Age, she receive a "refreshing" reply from a certain fox-type housewife servant, "you are already defeated in the race to claim the fox role!" (paraphrased). 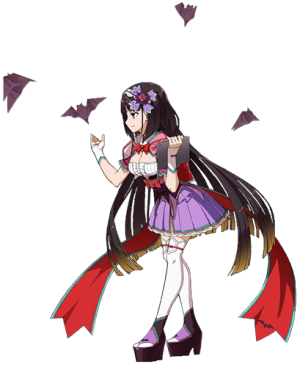 As such Osakabehime was summoned as a bat-motif servant. She thinks removing glasses is the kind of move a princess would do. It's doesn't matter if the place is gloomy as hell, she 'll still remove her glasses. A Great Magic that materialize a miniature replica of Himeji Castle, along with it’s so-called “barrier” and similar magical properties. By Means of a Majestic Appearance, come forth a beauty appreciable by all, one to relief other’s anguish. 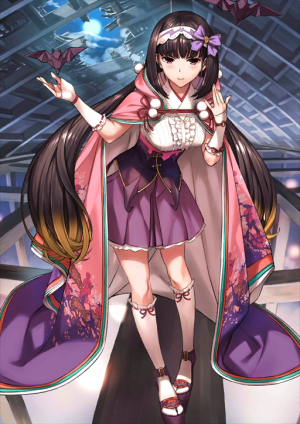 If Osakabehime takes a more aggressive stance, it is very possible for the castle to start attacking violently, but her shut-in nature seems to be the thing that confines her noble phantasm into a defensive type. This page was last modified on 5 October 2018, at 14:04.